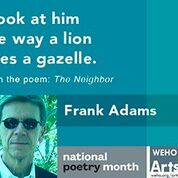 Frank Adams is a Lambda Literary Foundation Fellow in Poetry. He is a graduate of the University of Central Missouri, with a BS in History and an MA in Sociology. He trained as an actor under Lee Strasberg and Gordon Phillips at the Strasberg Institute in New York City and with Mitch Nestor at The Performance Gallery. He has been mentored in poetry by poets Steven Reigns, Sharon Doubiago, and Eloise Klein Healy. Two of his books: Mother Speaks Her Name and Love Remembered were published by Wild Ocean Press, San Francisco, California. He is a member of Kansas City Metropolitan Verse, Missouri State Poetry Society and the Writer's Place - Kansas City, Missouri.